Learn to write Mandarin Chinese characters! 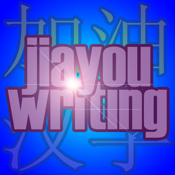 Jiayou Chinese Writing includes the 500 most commonly used Chinese characters, in animated format. This will ensure that you learn how to write them correctly, as they are animated with correct stroke order! We have added several different features due to your feedback. If you have any questions, complaints, or suggestions, please feel free to contact us!